Last year: I ranked Perry #42 and said he would be the starting slot receiver with 20 catches for 225 yards and 2 TDs (LINK). He caught 25 passes for 307 yards and 1 TD. Perry had a very tumultuous off-season going into 2017 when he faced felony charges in East Lansing. I thought that incident would – and should – turn into a short suspension during the season, but there Perry was against Florida in the season opener. 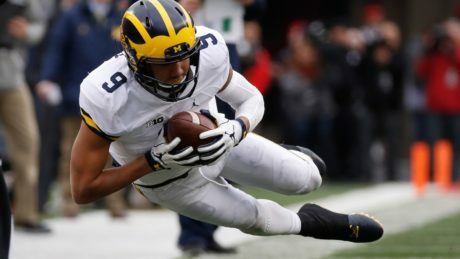 During a season in which the passing game struggled mightily, Perry ended up leading the position group in receptions and receiving yards with 25 and 307, respectively. His lone touchdown came against Cincinnati on a 33-yard reception on which Perry looked comparatively quick, but overall, it was a pretty uneventful season. Some might think a leading receiver should be ranked higher than #24 in a countdown like this, but I think 2017 was a fluke. Perry isn’t a bad receiver, but he’s not the best pass catcher on the team. Sophomore Donovan Peoples-Jones should be better, and sophomore Tarik Black is back from a broken foot. 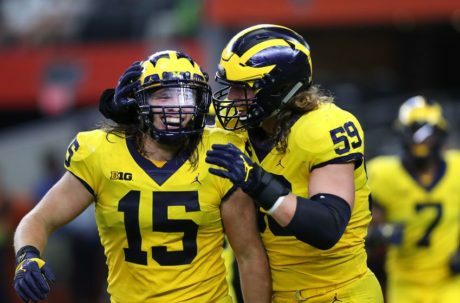 The Wolverines also have a couple tight ends who could eat up a lot of targets, depending on how much new quarterback Shea Patterson wants to look at them. We know what Perry is at this point, and that’s an okay slot receiver in the Big Ten. I think Patterson will find him dependable and he’s a solid blocker. Let’s see more of this guy on offense . . . Ty Isaac. 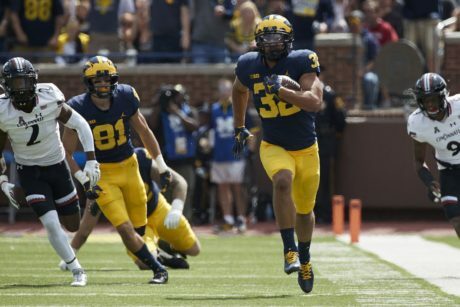 I hit on it last week when Isaac had 114 yards, and the Michigan coaching staff listened. Can you guys believe Jay Harbaugh reads this blog? I’m honored and humbled . . . Really, though, Isaac ran 20 times for 133 yards in this one and is averaging 8.0 yards a carry this year. 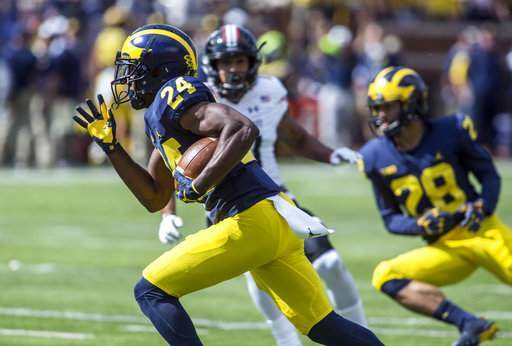 So far he has been the best back on the team, and Michigan should continue riding him until Chris Evans and/or Karan Higdon step up their performances. Hit the jump for more awards. The elephant in the room . . . could probably throw a football just as well as Wilton Speight. I kid, I kid, but those expecting a significantly better game against the lowly Cincinnati Bearcats should have been disappointed. Speight was 17/29 for 221 yards and 2 touchdowns, but there were a lot of bad misses, usually in the form of overthrows. Perhaps worse than the overthrows were the two fumbles, one when Speight mishandled a handoff to Ty Isaac and another when there was a botched jet sweep handoff to Kekoa Crawford. The handoff to Isaac was 100% on Speight, and the timing/mechanics of the Crawford handoff seemed to be off, though Crawford might deserve some blame there, too. Either way, the quarterback play wasn’t stellar. He did hit a long TD to Crawford and then hit Grant Perry over the middle for a 33-yard touchdown catch-and-run, but his footwork and mechanics on short and intermediate throws are all out of whack. How much can that be improved when the guy is an old redshirt junior in his third year in the system? Hit the jump for more on Saturday’s win. Let’s see more of this guy on offense . . . Ty Isaac. Isaac averaged 10.4 yards per carry on 11 carries, giving him 114 yards on the day. He had 50% as many carries as starter Chris Evans, who averaged just 3.5 yards/carry, and Karan Higdon averaged 4.0 yards/carry on 7 chances. Isaac had the hot hand on Saturday, and some observers have said he’s in better shape now than he ever has been. I’m done expecting Isaac to be a breakout star, but I sure wouldn’t mind a few more performances like this. Let’s see less of this guy on offense . . . Grant Perry. This has less to do with his performance on the field than his behavior on and off the field. The guy faced felony charges in the off-season, and on his first time touching the ball during the year, he spun the ball and earned his team a 15-yard unsportsmanlike conduct penalty. Did he learn his lesson? Nope. He spun the ball again later in the game. I’m not saying the off-the-field and on-the-field things are related, but maybe he needs some more tough love to help the messages sink in. Let’s see more of this guy on defense . . . David Long. It’s too early to call Long injury-prone, but he was injured and redshirted in 2016. Then he missed some time this spring with a nagging injury. And he exited this game early with a leg injury. He seems like a guy who’s in need of a steady diet of steak and whole milk. Let’s see less of this guy on defense . . . Brandon Watson. Directly related to the Long situation, I don’t think Watson is a starting-caliber cornerback and he could be taken advantage of by teams who game plan for him and have the right athletes. He’s a stop-gap guy, and I think it’s concerning if he’s a long-term starter. It helps greatly that Michigan has a very good pass rush, which mitigates some issues on the back end. Play of the game . . . Chase Winovich’s strip sack for a Noah Furbush touchdown. 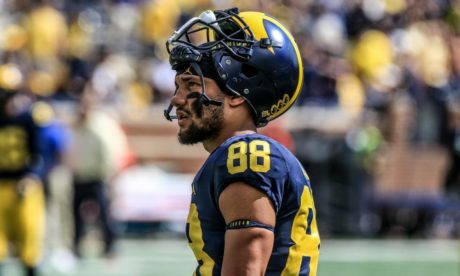 There are a few options for this honor, such as a couple Ty Isaac runs, a Brandon Watson pass breakup, a Josh Metellus tackle in the open field, a Wilton Speight deep ball to Nick Eubanks, etc. But the Winovich sack of Florida QB Malik Zaire sealed the game for the Wolverines, and Furbush did a great job of corralling the ball before it could trickle out of the back of the end zone. MVP of the game . . . Ty Isaac and Devin Bush, Jr. I can’t really choose between the two. The offense struggled to move the ball through the air, and Isaac averaged a first down every time he touched the ball. He also made a couple clutch plays to keep drives alive. On the other side of the ball, Bush made 7 tackles, 3 tackles for loss, and 2 sacks. He was all over the field and did a great job in his first game as a starting middle linebacker. He almost got booted from the game on the first defensive play when he was investigated for targeting, but luckily he stayed in the game to help Michigan win.